In New York, an Uncontested Divorce is a divorce where the parties agree to get a divorce, and have come to an agreement on all of the divorce related issues including grounds for divorce, division of marital property and debts, maintenance (alimony), child custody, child support, and who gets the tax deductions for the children. If you and your spouse can agree on these issues you will not have to go to court, everything is done on papers, and the process is faster and doesn’t cost as much as a contested divorce. You or your spouse has lived in New York State for the last one year, AND a) The two of you were married in NY, or b) The two of you lived in New York during your marriage, or c) The grounds for divorce occurred in NY. No Fault - Marrage is Irretrievably Broken for a Period of 6 Months. To use this ground, all issues of the marriage must have been settled first. Cruel and Inhuman Treatment – Physical and/or verbal abuse that occurred in the last 5 years such that it rendered it unsafe and improper for a spouse to continue to cohabit with the other spouse. Abandonment – One spouse abandons the other for a period of one or more years by moving away from the home, refusing entry to the home, or refusing sexual relations. Three Years Imprisonment - Spouse has been in jail for three consecutive years. Adultery – Third Party Proof Required. Conversion - This ground is for people that are currently legally separated that want to get divorced. You must have already lived separate and apart for one year pursuant to a separation agreement that was duly recorded with the County Clerk or you were separated pursuant to a Judicial Order. An Uncontested Divorce in NY begins with the filing of the Summons with Notice with the County Clerk by the Plaintiff's Lawyer after purchasing an index number for the case for the Supreme Court. Then the Plaintiff's Lawyer drafts an agreement that resolves all the issues of the marriage, and the Defendant's Affidavit. Both parties sign the agreement, and the Defendant signs the Defendant's Affidavit. The agreement must be prepared and signed in a manner consistent with how a deed is recorded, and signed in front of a Notary Public. Once the Defendant signs the papers, there will be additional papers drafted that only the Plaintiff will sign, and the RJI, Note of Issue, Findings of Fact and Divorce Judgement will be prepared for the Judge to sign. After the papers are reviewed and signed by the Judge, they will be returned for recording with the County Clerk along with a Disolution. At the end of the process, each party should get a Certified Copy of the Divorce judgment, and a date stamped copy of the Agreement indicating that it has been recorded with the clerk. A divorce agreement is a document that resolves all of the issues of the marriage including division of marital property and debts, maintenance, child custody, child support, and who gets the tax deductions for the children. 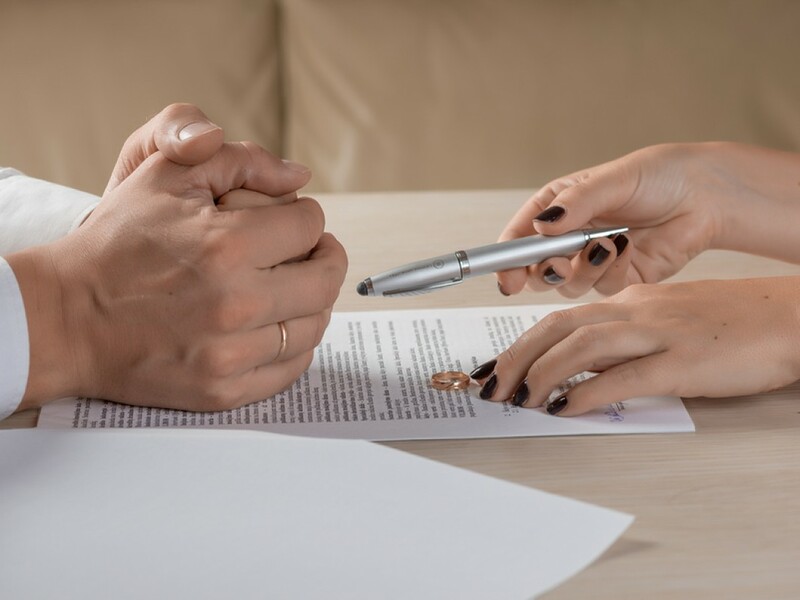 Every Uncontested Divorce should include an agreement, so you don't wind up in Court in the future to fix unresolved issues that should have been resolved in a proper divorce agreement. Marital Property is divided by a process know as equitable distribution. Equitable does not mean equal, but in most cases the parties choose to divide marital property equally to avoid conflict in an uncontested divorce. For instance, if the parties own a house, generally the equity in the home will be divided equally between the parties after the sale of the marital residence, or one party will keep the marital residence, and refinace the home to pay the other spouse his or her share of the equity. Marital property is all property acquired by either or both spouses during the marriage (including retirement accounts) and before the execution of a separation agreement or the commencement of a matrimonial action, regardless of the form in which title is held, except as otherwise provided in an agreement (prenuptial or postnuptial agreement), or that which is Separate Property. Separate Property is primarily property acquired before the marriage, property acquired by inheritance or gift from a party other than the spouse, Compensation for personal injuries, excepting punitive damages, and veterans benefirs exempt from attachment. Marital Debts are divided in the same manner as marital property. Generally debts should be divided in a manner that results in the least financial entanglement post divorce. For instance, if the parties have credit cards that are not held jointly, it is better if each party pay their own debts to avoid financial entanglement, rather than one party being responsible for paying the other party's credit card. In the event there are joint debts, it is better that the be paid off, or refinanced to avoid post divorce financial entanglement. Spousal Maintenance (formerly called alimony) is generally awarded to a spouse for the purpose of encouraging economic independence from the other spouse. The amount and duration of maintenance can be calculated using the Maintenance Calculator, however, people that are seeking an uncontested divorce usually have already decided how much maintenance is to be paid, if any, and are generally allowed by the Court to do so. In an uncontested divorce parents general choose Joint Custody and share parenting time with the children based on their availability. Most of the time the parties can get along as choose to divide parenting time as agreed and arranged rather that having a set schedule outlined in their agreement. The decisions regarding health, education, religion, and welfare of the children are also made and decided by both parents together. Child support is generally paid by the parent that spends less parenting time with the children (non-custodial parent), to the parent that spends the most parenting time with the children (custodial parent), based on the formula set forth in the Child Support Standards Act (CSSA). The Child Support payable can be difficult to calculate, so use the Child Support Calculator. The amount payable is called the "basic child support obligation". In addition to the basic child support obligation each parent pays their pro-rata share of health insurance premiums, uninsured medical, and daycare expenses, based on their individual incomes. The non-custodial parent may also agree to purchases a life insurance policy on his or her life, naming the custodial parent or the children as irrevocable beneficiaries, to secure future support payments. Opting out of the CSSA: In an uncontested divorce, parents sometimes agree to opt-out of the CSSA, and pay an amount of support that is more or less than the requirements of the CSSA. The Court will approve such an agreement so long as good reasons are set forth in the agreement. If the parties have dependent children the agreement should state which party gets the dependent income tax deduction for the children. It is common for one parent to either take the deduction for all the children in the odd tax years (and the other in the even years), or state which parent gets the deduction for each of the children. As part of the uncontested divorce, either party may resume his or her former surname. The name change will be stated in the Judgment of Divorce. Just present a certified copy of your divorce judgment to the Motor Vehicles Department and the Social Security Administration.